Arancini or arancine are fried (or, less commonly, baked) rice balls coated with breadcrumbs, said to have originated in Sicily in the 10th century. Arancini are usually filled with ragù (meat sauce), tomato sauce, mozzarella, and/or peas. The name derives from the food's shape and color, which is reminiscent of an orange (the Italian word for orange is arancia, and in Sicilian, arancici means "little oranges"). Arancini is masculine plural, the singular is arancino. 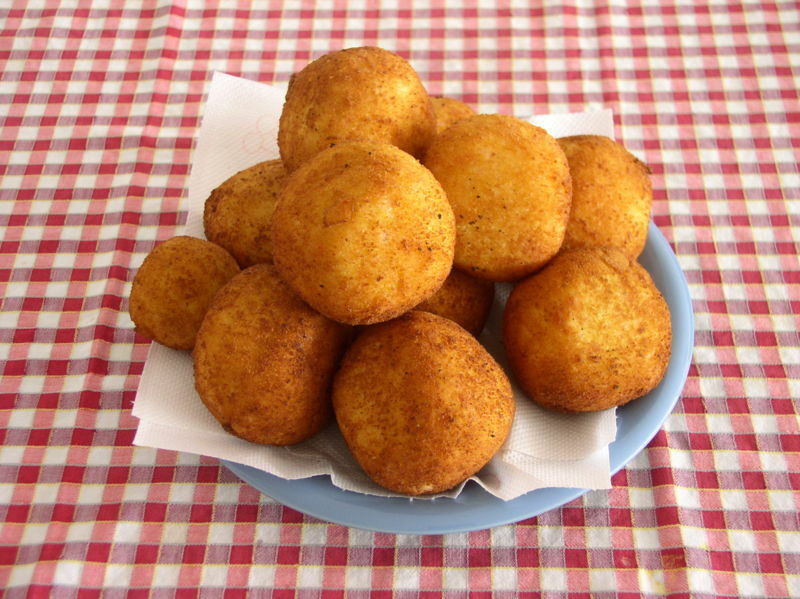 In some parts of Sicily, the feminine plural, arancine, is common. There are a number of local variants that differ in filling and shape. Making the filling according to the traditional recipe will take a couple of hours, during which time you can cook the rice as well and let it cool. The actual assembly and frying of the arancini will take about an hour more. If need be you can prepare the filling ahead of time and keep it in the refrigerator until you're ready to use it. The rice, on the other hand, should be cooked when you're ready to proceed. Finely slice the onion and mince the garlic, and sauté the mixture in the olive oil until it wilts. Stir in the ground meat, continue cooking until it is well browned, and then stir in the wine. While it's evaporating, dilute the tomato paste in a ladle of warm water and stir it in. Season the mixture to taste, and simmer it over a very low flame for a couple of hours, adding more warm water or broth as necessary to keep it from drying out. Towards the end of the cooking time, steep the dried mushrooms in boiling water for a few minutes and coarsely chop them. Stir them into the sauce too; cook it for 15 minutes more and it's done. While the meat's cooking, simmer the peas until they're tender. Then remove them from the fire, drain them, and let them cool. Dice the mozzarella into half-inch cubes and combine it with the cool peas. The other thing to do while the meat is cooking is prepare the rice: boil it in abundant, lightly salted water, and while it's cooking lightly beat two of the eggs. When the rice is done drain it. Transfer it into a bowl, let it cool slightly, and stir in the beaten eggs, grated cheese, and saffron. Let it finish cooling. Assembling and frying arancini: when everything else is ready, lightly beat the remaining eggs and season them with salt and pepper. Then, preheat your oven to 350 F (180 C). Next, make the first arancino by taking two small handfuls of rice and shaping them into hollow hemispheres Fill the hollows with some of the meat, and some of the peas, and mold the two halves together to obtain a smooth-sided rice ball about the size of a small orange (1.5 - 2 inches in diameter). Roll the arancino in flour, dredge it in the beaten egg, roll it well in the breadcrumbs, and fry it in abundant hot oil. While it's cooking begin with the next, and when the one that's frying has become a golden brown drain it on absorbent paper. When you have finished frying all your arancini, heat them through in the oven for five minutes, decorate them with the orange leaves if you choose to, and serve them piping hot.